Sturm, Ruger & Company, Inc. (NYSE: RGR) is pleased to announce the Ruger® “I Took the Challenge Contest,” a photo and essay contest that will help Ruger find the top eight customers who contributed to the Ruger “1 Million Gun Challenge to Benefit the NRA.” Eight finalists will win their choice of a Ruger SR1911™ or a Ruger Gunsite Scout Rifle, and America will vote to send one of the finalists on a “trip for two” to the 141st NRA Annual Meeting in St. Louis, Missouri. Participating in the contest is easy! 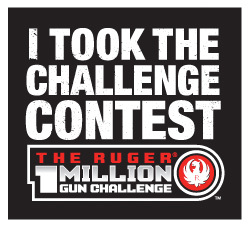 Visit Ruger.com/Million to submit an essay (400 words or less) that shares your story of why you purchased a new Ruger firearm during the 1 Million Gun Challenge, and upload a photo of you with your new Ruger firearm. Entries are due before noon on March 6, 2012. Ruger will then choose eight finalists and post their essays and photos on the Ruger.com/Million website. America can start voting for their favorite finalist at noon on March 16th. The Grand Prize winner and a guest will travel to the 2012 NRA Annual Meeting on April 13-15 with an opportunity to join Ruger in presenting the final 1 Million Gun Challenge check to the NRA. Don’t get chosen as a finalist? You can still win! 25 Second Prize winners will win a 1 Million Gun Challenge commemorative knife and coin kit. To register and read the Official Rules, visit Ruger.com/Million. Like Ruger on Facebook.com/Ruger to learn more about the finalists and follow the competition.